On Monday before we left to come home, we went down to the vegetable patch to harvest some potatoes. 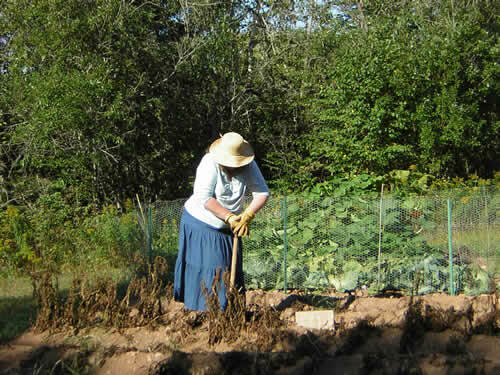 Here is a picture of Karin digging up some of the heirloom fingerling potatoes she likes. 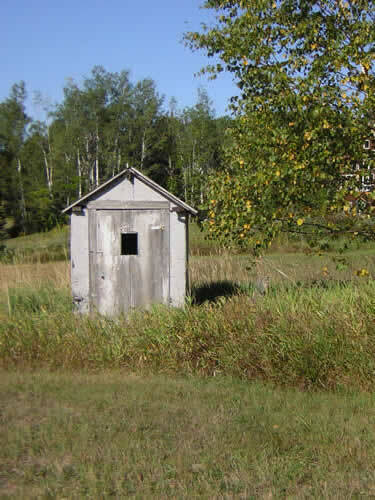 And I took this picture because there was just something about this old outhouse, weathered and standing out in the field, that seemed so picturesque and perfect. Later that same day …. Here are some pictures you might enjoy of our puppy (we can’t call her “new” anymore, can we? ), Beulah Mae. 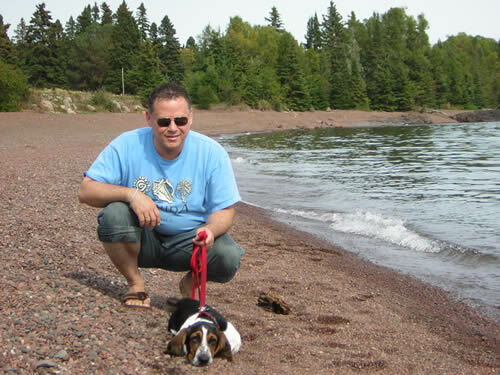 On Sunday afternoon we went for a drive up the North Shore, beyond Grand Marais and past Five Mile Rock to a long beach that is good for walking and agate-hunting. 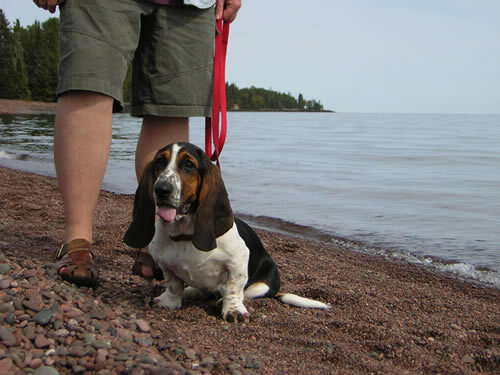 Beulah and Harald walking on the beach. Isn’t she growing up into a beautiful dog? 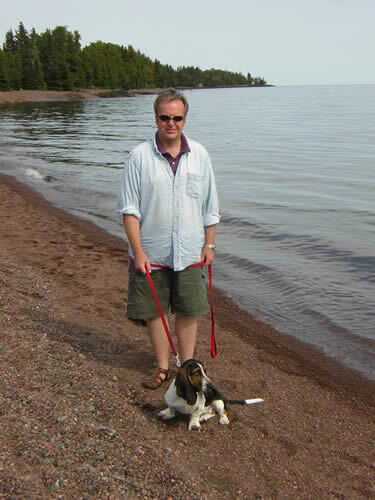 Proof for all those who think I’ve lost weight – clearly it isn’t so! But Beulah loves me just the same. 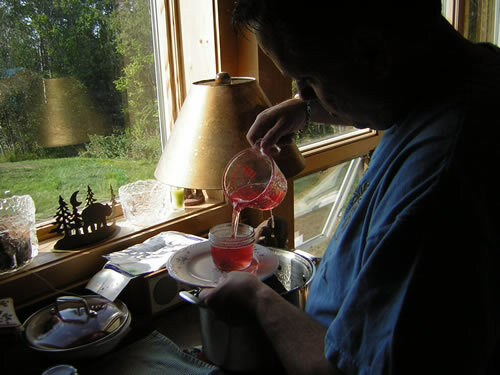 Happiness is … making jelly! 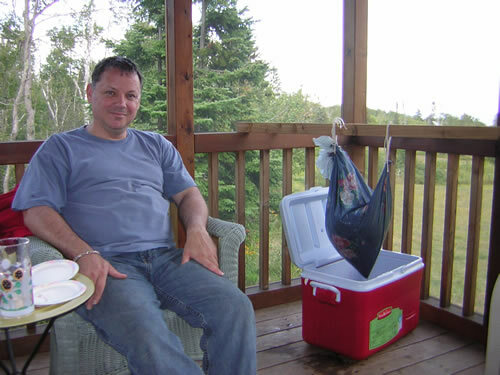 What is one wonderful and delicious way to spend your Labor Day weekend on a relaxing trip to the North Shore? 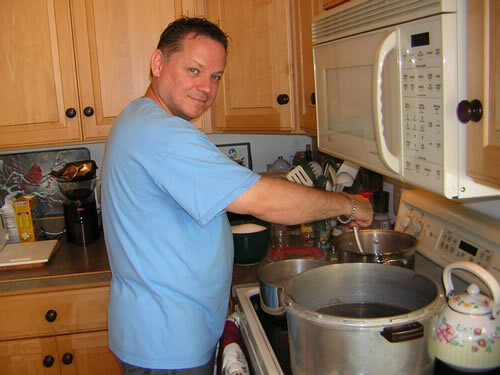 Why, making jelly, of course! 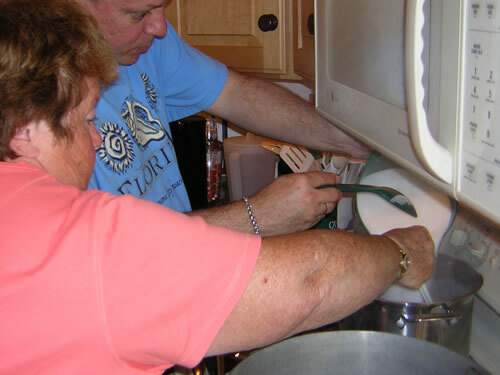 After we arrived on Saturday morning, Karin took me on a trip around the land on the Gator and we stopped by one apple tree on the way toward the garden to check out the squash and cabbage and potatoes and …. Well, one thing led to another and before you know it, Karin had very helpfully driven me around to some particularly good apple and crabapple trees and we headed back to the house with bags of our fresh-picked fruit. A quick conference with Helen and Kaare and we were back on the Gator headed down to a few more crabapple trees to pick even more fruit. 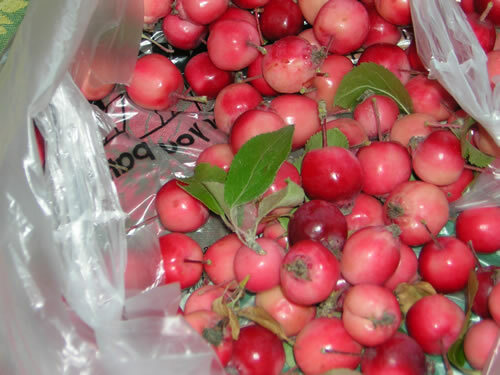 And Helen went out later and picked a while bunch of really beautiful pink crabapples from a tree she knew about. 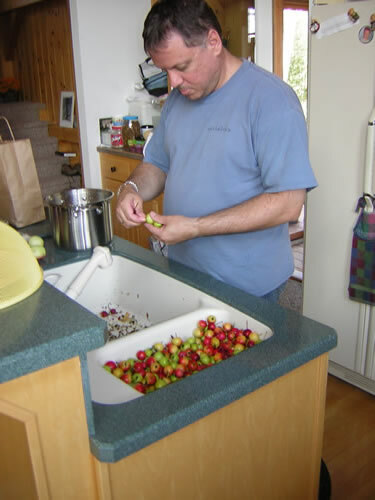 Me cleaning crabapples – for what seemed a very long time! 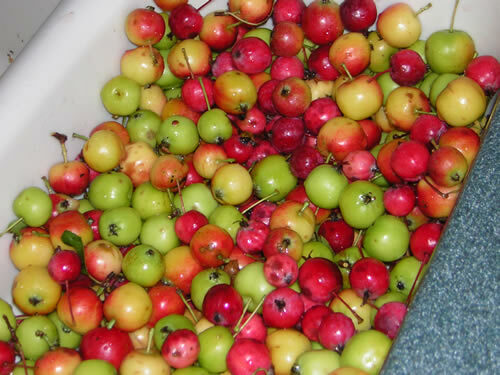 What a colorful batch of crabapple fruit, huh? 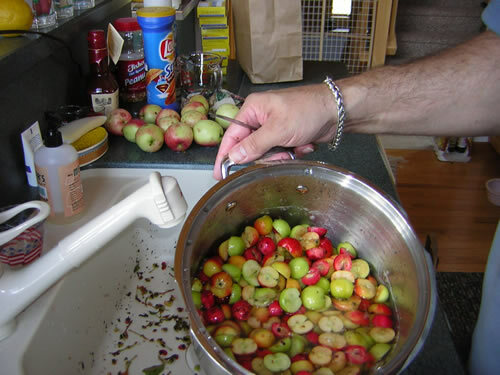 The lovely, rosey-pink crabapples that Helen found and picked. 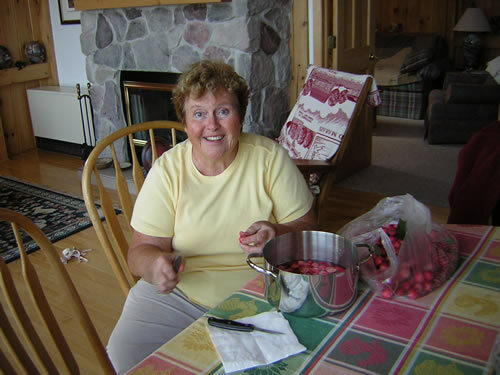 Helen cleaning and cutting her pink crabapples. Fruit in the pot, about to get boiled. 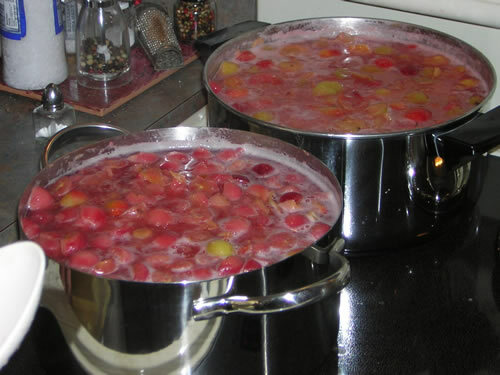 Pots of fruit boiling away on the stove to render the needed juice. 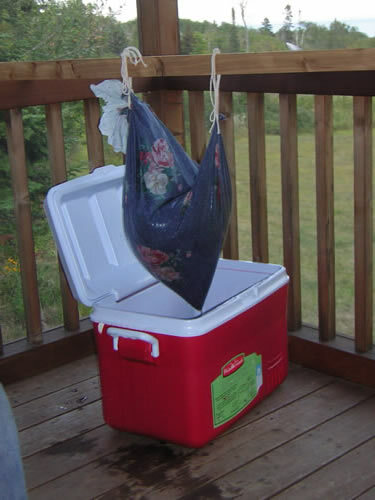 The bag of cooked and crushed fruit, draining into a cooler, the only thing we had that was big enough. The jellymaker and his bag. Dontchaknow a watched bag never drains! 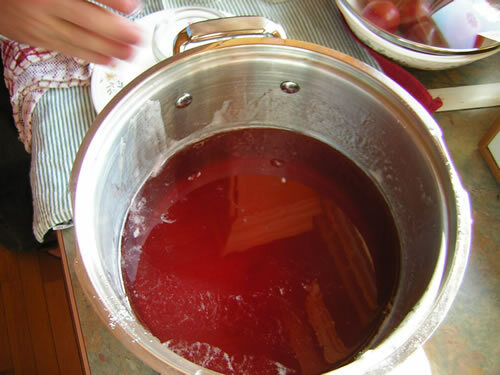 The next day, cooking some juice to make it into jelly. Jars and lids sterilizing on the stove, jelly cooking in the back. 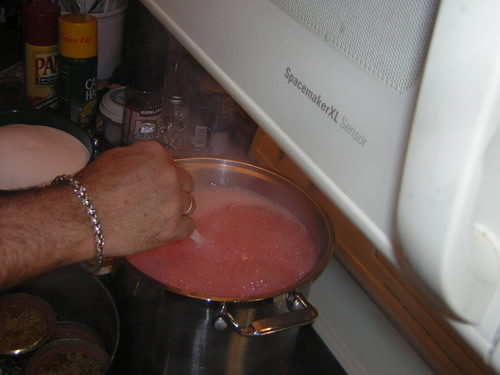 Adding the sugar to the boiling juice. Sugar added, the juice bubbling up thick and hot like lava. 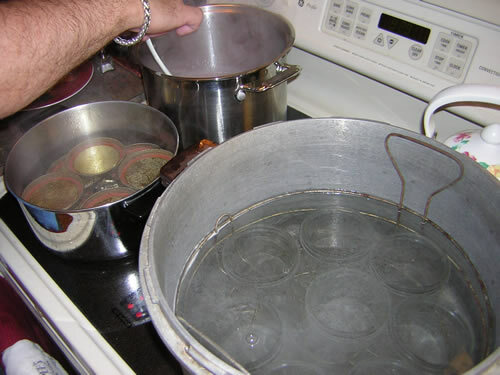 Getting the jars out of the boiling water and ready to fill. 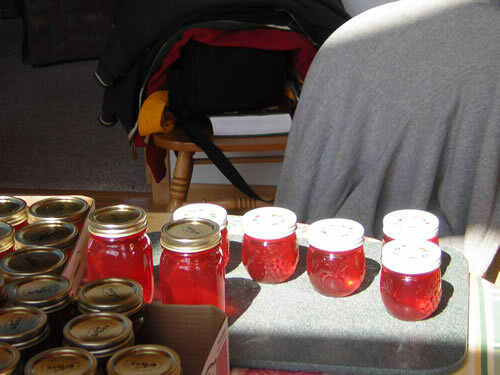 The hot, clear crabapple jelly before it gets canned. Filling the jars with the lucious pink liquid. Jars that just came out of their hot water bath, cooling and sealing. 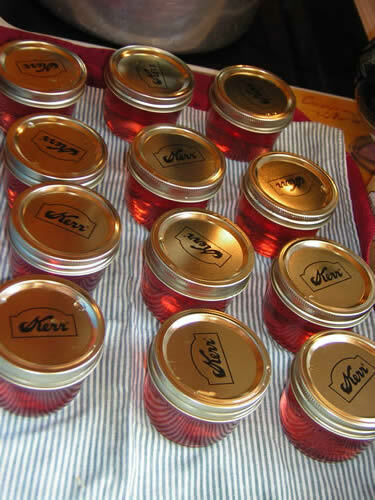 The sun shone on the beautiful jars of jelly. 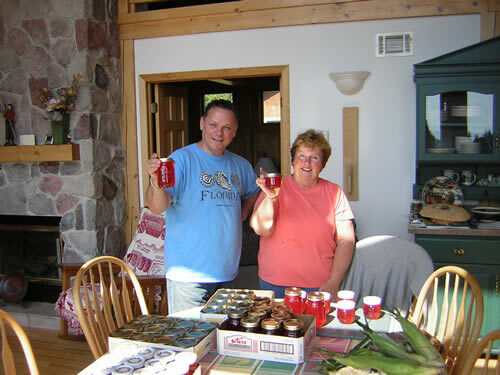 The jellymakers and the delicious product of their labors.